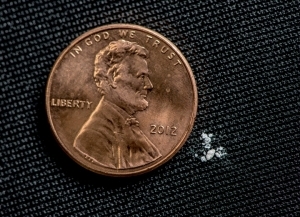 This photo shows the actual size of a lethal amount of fentanyl (white powder to the right of the penny). Photo courtesy of the DEA. PENDLETON, Oregon – U.S. border agents seized the largest-ever illegal fentanyl shipment late last month. The seizure set off alarm bells throughout the Western United States because the highly addictive opioid was coming from Mexico. The seizure of more than 250 pounds of fentanyl which was bound for Arizona has a street value estimated at $3.5 million. It’s similar to morphine but is 50 to 100 times more potent and is typically used to treat patients with severe pain or to manage pain after surgery. It’s also legally prescribed for those who have chronic pain and don’t get relief from other opioids. It is very dangerous to touch or inhale even a small amount of fentanyl. Police officers, including K-9s, have suffered from exposure to it. “It’s actually changed the way most law enforcement agencies do business in terms of processing suspected controlled substances in the field,” Roberts said. Fentanyl is also considered to have caused nearly half of all drug overdoses in the U.S., according to information from the Drug Enforcement Administration.